I have found a new favourite diaper! I love the feel and most importantly, Chase is completely satisfied with the feel. We haven’t bought a box yet! I will know for the next little one which ones to choose right away because they only go to size 3 which is what Chase needs. Right now we are finishing up a large pack of diapers from Sam’s Club- I don’t want to waste the money so I am still somehow managing to put them on Chase. We almost have one blowout a day (today was 3 blowouts!) and I wonder when I will just get over it and move onto size 3?! My second fav is Pampers Swaddlers and can get them reasonably at Sam’s club in a huge box! 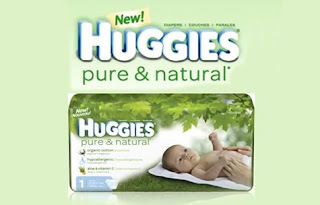 I also like huggies but now that they’ve created pure and natural… yay! They are so soft! I will never again use Parent’s Choice diapers because we had too many blowouts and he doesn’t like the feel. Yep, I have a texture baby! He is very much a texture baby. Also, nothing can touch his face while sleeping unless it’s ultra soft. Thankfully we have a few blankies and a froggy snuggly to suffice. If I was doing cloth, I would be doing SO many loads of laundry! Defeating one of the purposes of a cloth diaper :) This boy pees and poos so much and large quantities too! Try out a sample if your baby fits the size! What is Gifts to Grow? Click here. And… What kind of diaper do YOU prefer or recommend? The Huggies Pure & Natural are absolutely my favorite too!! (& I have seen them in 4's & 5's!!) Unfortunately, they are the most expensive ones I've seen. My grandmother gave us a big box of 2's, but sadly they are gone! And I'm right with you – Swaddlers come in a close second. Although I'm sad they only go to size 2-3. Josiah needs 3's too, but we're trying to finish up what we have of the 2's. You definitely get what you pay for in diapers… and that's one area I might just have to keep splurging.